As 2017 draws to a close, the tarnished reputation of North American police officers continues to sink; every week brings new reports of reckless police violence, corruption and discrimination. It'll be interesting to watch how the entertainment industry tells stories about this important shift in societal perception of cops — from hero-worship to contempt and distrust. Will writers and filmmakers successfully frame stories in a way that cuts to the centre of the nature of unchecked power? Or, will they model themselves after director David Ayers and make a faux-philosophical film about the inner worth of Orcs with guns? 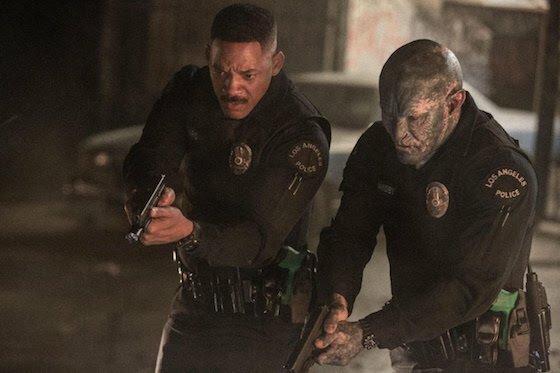 The film Bright stars Will Smith and Joel Edgerton in an alternate-universe Los Angeles, a city filled with ostracized Orcs, one-percenter elves and corrupt humans, all at each other's throats. Smith plays Officer Ward, a jaded family man who resents his forced partnership with Jakoby, America's first Orc police officer. Ward's characterization reveals itself in subtle gestures, such as when he snarls "Fairy lives don't matter," as he beats a spritely creature to death in his front yard. Get it? People of colour can be racist, too! It's a twist worthy of M. Night Shyamalan. Edgerton plays "diversity hire" Officer Jakoby as an Orc with a heart of gold trying to overcome prejudice against his marginalized race. If Bright sounds slightly heavy-handed and bizarre, it's because it is. In any artistic experiment that plays with actual social issues there's a tangible risk of disrespecting real-life victims. Screenwriter Max Landis (American Ultra) and Ayer throw caution to the wind and play Bright's central metaphor — that race should play no part in determining anyone's worth or capabilities — like a goddamn xylophone, blindly hitting whatever note is within reach. The confidence of white men never fails to astonish. Luckily for Bright, it possesses the Will Smith factor. Smith is so magnetic and generous an actor that he could easily co-star with a wilted piece of asparagus and make the banter work. He's well matched with Joel Edgerton (Loving), who displays subtlety through a good inch of Orc makeup, and deftly responds to Smith's ability to anchor a scene; he chats endearingly all through Ward's hostile silences and makes Jacoby feel less pure and downtrodden. Australian actress Lucy Fry tags along as Tikka, a persecuted elf trying to keep a rare magic wand from an evil cult, moaning in Elvish and shrieking at all she sees like a reinterpretation of Jodie Foster's portrayal of Nell. The film wants to make them into an iconic trio, but the way Tikka is written has Fry feeling more like a package to be delivered than a complex being. There's also a subplot about a prophecy, countless brutal shootouts, and a lot of fuss about an ancient magic wand that must be protected or an Elvish cult will destroy the world, but it's all just sound and fury.